A twin unit static caravan is made up of two separate parts that are designed to be constructed on site and joined together with clamps or bolts. The caravan, as a whole, is then able to be towed or moved from one place to another and sited. The increase in popularity of caravans has led to a higher demand for more space and indoor facilities. This demand meant that twin static caravans, in a simple bid to bring more space and a ‘home-like’ feel to caravans were developed. Instead of one whole caravan being moved, the caravan is split in two. Twin units are ideal if you want more space and have outgrown your existing single unit. Browse our range and get in touch with your enquiry and to book a viewing. Why do caravanners choose twin units? Twin units allow static caravans to become multi-functional spaces that can fulfil the specific needs of the buyer/hirer. With bigger units, you naturally have more choice and freedom and they are particularly appealing to large families and couples who wish to have a spare room, guest room, or even craft room. In essence, it’s about having more choice, within your budget, and the chance to have space to make your own in the years to come. Consider selling your used static caravan to us, and we can make a fair offer to purchase it from you, which can go towards the cost of your twin unit. We can also transport it from where it’s sited to our location if you remove any decking and utilities beforehand. You can also then buy your twin unit from our range, which we can also transport and site within 100 miles of our base in Horsham. Our twin units suit a range of budgets and offer great flexibility for living. We stock a wide range of twin units and are constantly changing our stock as we sell and buy in new second hand units to sell. If you can’t find what you’re looking for on our site, don’t hesitate to get in touch with your requirements and we will do our best to source the right model for you. The advantage of having a twin unit static caravan is the space. 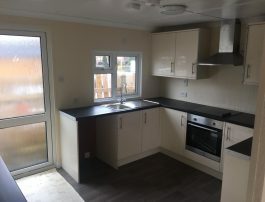 They normally have good sized bedrooms and large communal spaces with room for a dining table, a modern kitchen and all of the modcons you could want. With added space in a twin unit, you can benefit from more amenities, especially if you are a larger family. With the extra space comes more privacy and less stress, and maybe even the chance to take your possessions out of storage if you have been living in a smaller unit. For more comfort, choose double glazing that has already been installed, as well as central heating. 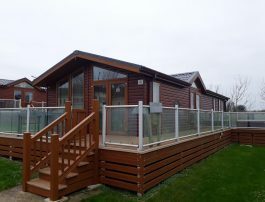 See more benefits of central heating and double glazed caravans. As we acquire new static caravans, we also pride ourselves on revamping and re-decorating in order to make what we sell the very best it can be. In these instances, you can move in right away and start enjoying the space. We stock both furnished and unfurnished twin units, both of which provide you with the options to personalise it to your own tastes. With the increased space, you can put your stamp on the property and accessorise exactly how you want. On the other hand, you can choose statics that have been completely redecorated with a new stylish kitchen for example, brand new central heating system, as well as all new carpets and bathroom. As we refurbish with modern looks, these are ideal for both home or business uses, with the option to have a spare room turned into an office. Look no further. We have been providing siting and transport services for over 40 years. Our experience means we can ensure that your caravan or park home will be transported securely and safely wherever you wish, within 100 miles of our showground in Horsham. We also offer storage and transport preparation services, installation of new or used units and finally, we will assemble your home on site. If your needs are more specific and you would like to relocate your caravan/mobile home to a smaller location, we can be in touch and create tailored solutions just for you. We pride ourselves on our exceptional number of caravans, both new and used. With a quick turnover of stock, we are always ensuring that we are providing our customers with the latest units and these are on display at our site where we welcome you to book viewings. It is important to us that our customers are satisfied that they have seen our entire range that includes, 10ft, 12ft and 20ft wide statics, in order for them to make an informed decision. We also understand that customers are keen to receive their goods quickly after purchase. Our experienced staff are always on hand and fully prepared to make the transition as quick and as easy as possible so that you are enjoying your new unit as soon as you can. We believe that by having experts who fully engage with what we are offering and share our passion, we can build a trusting relationship with our customers for the entire process, from an initial enquiry through to siting. We understand that caravans are necessary for any circumstances. Whether it be for business, leisure or for temporary accommodation when your house is being rebuilt. With our unparalleled knowledge of our stock we are able to offer exactly what you need. Browse our online stock of static caravans and book viewings to see your preferred units in person. 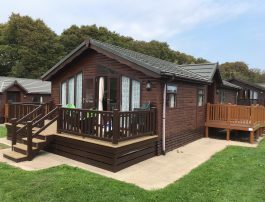 When viewing the units online you can see the list of amenities that each static caravan has to offer, as well as a quality rating on a model’s condition. Some statics may need some work, however we are able to recommend some great companies that we work with who can fulfil any needs that you have. So, fill out a booking form to come and take a look.